Sharjah Film Platform (SFP), the new annual film festival organised and presented by Sharjah Art Foundation, had its official opening this past weekend. In addition to film screenings, SFP’s opening also included a programme of talks and workshops led by local, regional and international filmmakers and film industry professionals. SFP’s film screenings and workshops will continue to run through Saturday, 26 January 2019. The screenings take place daily in four venues across the city of Sharjah: Mirage City Cinema, Al Mureijah Square; Sharjah Institute of Theatrical Arts, Al Mureijah; Al Hamra Cinema, Rolla; and Africa Hall, Al Manakh. The inaugural edition of SFP features screenings of over 140 short and feature films in the narrative, documentary and experimental categories. A number of feature films will be screened this week. Who is Now Lying, for example, is an Indonesian film in Indonesian and Malay by director Muhamad Erlangga Fauzan; the Arabic-language film Cactus Flower is by Egyptian director Hala Elkoussy; and Hills Without Names by Azeri director Hilal Baydarov is in Azerbaijani. More than 40 countries and over 30 languages are represented in SFP, including English, French, Spanish, Farsi, Hindi, Urdu, Malyalam, Tagalog, Japanese, Haitian Creole, and Serbo-Croatian, among others. A number of films focus on issues related to people with disabilities, including the short film My Name is Nour (2018) by Egyptian director Haisam Abdelhamed and the documentary Baitna Cheshire (2017) by Sudanese director Muzamil Elrayah. Also showing this week are three restored films by legendary Egyptian filmmaker Youssef Chahine. The films will be shown in Africa Hall in collaboration with The Africa Institute as part of SFP in commemoration of the tenth anniversary of Chahine’s passing. Programmed by Dr Salah M. Hassan and Hind Mezaina, this special focus on Chahine will include the screenings of Cairo Station (1958), The Land (1969), and The Sixth Day (1986). Spaces of Exception (2018), which had its world premiere at SFP during the opening weekend, will be shown again on Saturday, 26 January at 3:00 pm in Sharjah Institute of Theatrical Arts. SFP will run through Saturday 26 January 2019 in four venues in Sharjah: Mirage City Cinema, Al Mureijah Square; Sharjah Institute of Theatrical Arts, Al Mureijah; Al Hamra Cinema, Rolla; and Africa Hall, Al Manakh. The opening day was launched with a hands-on workshop on the essentials of screenwriting as well as a panel discussion on the new technologies of moving image, which explored the possibilities of virtual, augmented and mixed reality while examining the ethical and cultural implications of such technologies. This panel was followed by a conversation between Jay Weissberg (film critic, Variety) and Emirati filmmaker Abdulla Al Kaabi. The pair discussed Al Kaabi’s work, as well as the local film industry in general. 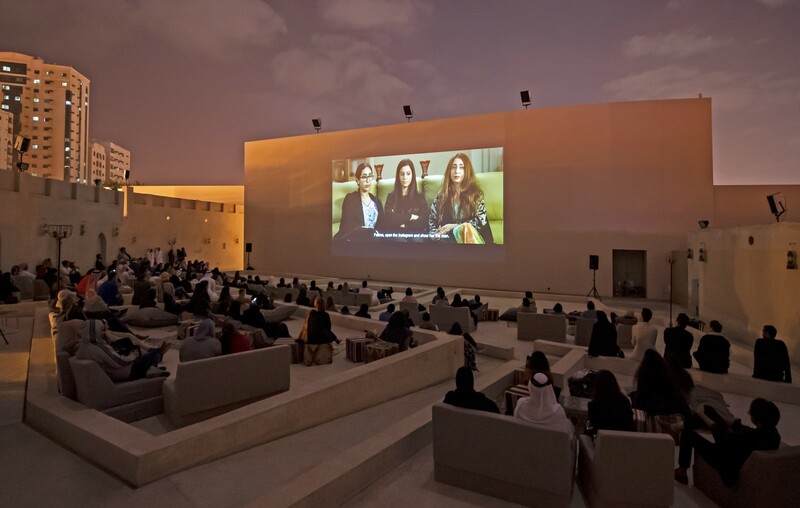 After the opening reception in Al Mureijah Square, Sharjah, the newly-created films by two of the three SFP Short Film Production Grant awardees were screened in the open-air Mirage City Cinema, Al Mureijah Square. The screenings of the two short films, Laymoon (2019) by Emirati director Abdulrahman Al Madani and Maryam (2019) by Emirati director Mohammed Al Hammadi, were followed by a Q&A session with the two filmmakers. The second day of SFP kicked off with a panel discussion on documentary filmmaking, examining the possibilities for expanding documentary filmmaking as a practice and genre, and it concluded with the world premiere of Spaces of Exception (2018), a 90-minute documentary profiling the Native American reservation alongside the Palestinian refugee camp. Taking place in conjuction was a workshop which connected locally-based film critics and film enthusiasts. The group discussed the emergence of Arab indie films, the representation of social issues and identity in short films, and the challenges of being an emerging filmmaker in the MENA region. SFP’s talks programme concluded yesterday with three distinct panel discussions on funding for MENA artists and filmmakers, the challenges and opportunities of present-day distribution, and the legal aspects of filmmaking, respectively. Film screenings and workshops will continue to run through Saturday, 26 January. SFP has been supported by Sharjah Islamic Bank. Tickets to the film screenings are currently available for purchase online on Ticketmaster. They will also be on sale at the screening venues on the days of the screenings and at the box office in Sharjah Art Foundation’s Information Centre, Al Mureijah Square through 26 January. The box office in Al Mureijah Square will be open from 12:00 pm to 10:00 pm from 18 to 25 January and from 12:00 pm to 4:00 pm on 26 January. To purchase tickets on the day of a screening, visit the SFP box office or one of the four venues it will be screened at. SFP screenings are organised in 23 programmes, consisting of one or more films, with all programmes repeated during the week at different timings. Ticket prices are 15 AED per programme, but a discounted price of 8 AED per programme is available for bulk ticket purchases of 10 or more. Doors will open 15 minutes before the screening of each programme and close 5 minutes after the designated screening time. Please note that all seating is on a first-come, first-served basis and cannot be reserved in advance. Further details are available on Sharjah Art Foundation’s website. Visit sharjahart.org to learn more. Reflecting the growing importance of film in its work, Sharjah Art Foundation launched Sharjah Film Platform (SFP), an annual programme that supports film production in the United Arab Emirates and the region and provides a critical platform for both established and aspiring filmmakers. SFP has three main components: a curated film programme and award; a programme of talks, workshops and discussions; and a production grant for short films. Sharjah Art Foundation is an advocate, catalyst and producer of contemporary art within the Emirate of Sharjah and the surrounding region, in dialogue with the international arts community. Under the leadership of founder Hoor Al Qasimi, a curator and artist, the foundation advances an experimental and wide-ranging programmatic model that supports the production and presentation of contemporary art, preserves and celebrates the distinct culture of the region and encourages a shared understanding of the transformational role of art. The foundation’s core initiatives include the long-running Sharjah Biennial, featuring contemporary artists from around the world; the annual March Meeting, a convening of international arts professionals and artists; grants and residencies for artists, curators, and cultural producers; ambitious and experimental commissions and a range of travelling exhibitions and scholarly publications.